A Native of California, David received a BA in Philosophy and Religion at Point Loma Nazarene College in San Diego. After returning from a European arts study program, he became interested in the history behind the French Resistance during World War Two. Writing fiction has become his latest way to explore philosophical, moral and emotional issues of life. The Siren of Paris is his first novel. I love ocean liners because they have souls. When someone reminisces of a past crossing, you can hear in their voice how the soul of that ship seduced them for five or six days. Which brings me to the reason I know you love ocean liners, which is the same reason you love to read a good book, walk through a museum, or to make love, and that is to escape. 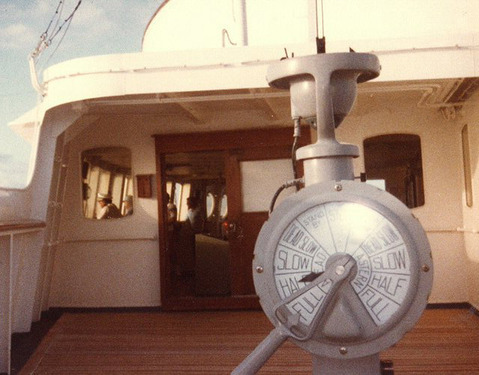 The S.S. Normandie was the ultimate ship of escape before the Second World War. The dining room towered three decks high, exceeding the hall of mirrors at Versailles. Imagine the experience of passing through the large double doors and descending the stairs into this magnificent room. The ship elevated dining to a sacred rite carried out in a chapel of Rene Lalique crystal lights under the watchful eye of a statue of peace. Passengers escaped then to dance in the main lounge, surrounded by glass murals depicting the mythical tales of the gods. 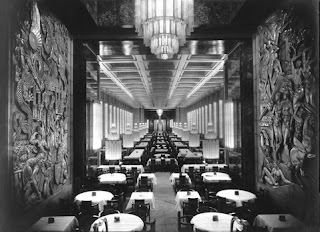 After a late evening smoke surrounded by gold lacquer Art Deco murals by Jean Dunand, they would bid goodnight. Even the smaller ships have a soul. 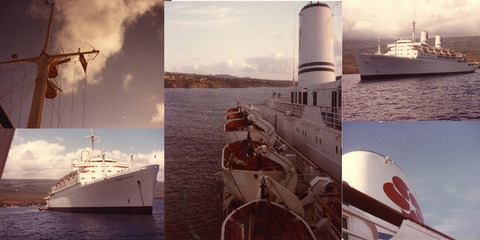 I sailed on the S.S. Constitution when it was in Hawaiian service. With my Kodak 110 instamatic camera, I terrorized the ship like a Japanese shutterbug tourist gone insane. Years later I went searching for them again. Oh, and to my surprise I discovered people online who also shared an interest in the sister ships, S.S. Constitution and S.S. Independence. I found a small glimpse of the soul of this ship, taken from the bridge wind wing through my trusty 110 camera. Of course, I was a highly dignified passenger, the most distinguished type of gentleman. I was the type of young man with dashing luscious looks, sophistication, and style. I imagine there were quite a few ladies with crushed hearts on that voyage when it ended. 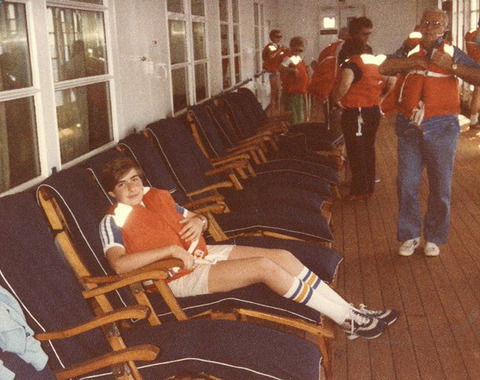 This is a picture of me on the boat deck at the lifeboat drill. How do you like my tube socks? When a ship dies, we mourn for it like a living being. I give you Titanic. It has been over 100 years now, and countless movies have played out the drama of this great ship of dreams as it died. The memory of Titanic continues to haunt us to this day. People don’t do things like that unless there is a soul they have come to know and love. My research for the book The Siren of Paris required me to understand the real transportation challenges of anyone in Europe after Sept 1st, 1939. I wanted to know not just how someone could escape war torn Europe to return to American, but how many ships, when did they sail, and anything else that could offer escape. I turned to the Steam Ship Historical Society for research assistance, and Alisha went to work for me trying to dig up records about what sailings were available, the cost, and the last time a ship left Europe with passengers. Marc, the protagonist of my story, has a particularly significant job with the American Embassy. He is the travel liaison for the over 30,000 Americans trapped in Paris after the outbreak of the war. The discoveries made in this research were surprising to me. 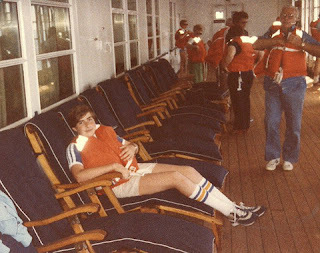 If you could afford it, then a ticket on a Pan Am Clipper could take you back to America from Lipson, Portugal through the Azores. The Italian line continued to run ships, just weeks up to the time they entered the war, for $2000 American dollars for cabin class. That is not adjusted for inflation. 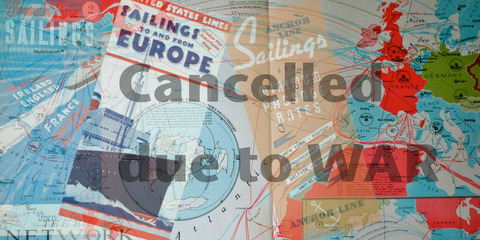 The S.S. George Washington and S.S. Manhattan started to come to Europe beginning in Jan 1940. Each ship had “United States,” in bold lettering, with large American flags painted on the side. The war could have turned out much differently if a U-boat had accidently fired upon an American ship, which almost did happen the morning of June 11th, 1940. By accident, I discovered the RMS Lancastria, which is a small one stack Cunard liner that took on over 7,000 British soldiers and civilian refugees on June 17th, 1940. The exact number is unknown, because they stopped counting at 7,000. This discovery shocked me because even though I believed I knew a lot about ocean liner history, I knew nothing about this little ship. Winston Churchill covered it up during the war. The sinking was not reported on the D-System, and survivors were told not to talk about it under threat of court marshal. It was desperate times, and morale was everything for Britain, so the government felt another horrible news report was unnecessary. 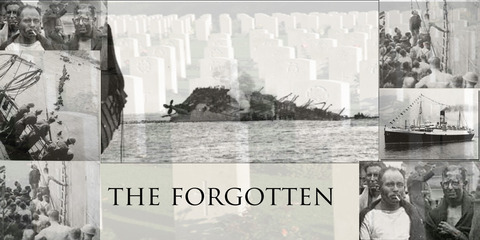 Yet many loved ones back in England never knew the fate of these men until after the war. I ordered a book written by G. Bond in 1954 called Lancastria. In the pages of that book, I discovered just what happened and how many “civilians” were on the ship. I thought it rather odd that the sinking is virtually unheard of, considering it is the single largest loss of life ever for a British Passenger ship. And the records, if they still exist at all, are reportedly sealed for 100 years. That did not seem terribly nice to me, and it is certainly unfair to the families of victims who want to know what happened. Titanic has the book A Night to Remember. There are documentaries on the Lusitania and the Andrea Doria, but the little old one-stack liner Lancastria had no such story. “May the Lord be with you,” are the opening lines of this story. The graveyards of the dead are listed, calling the troops of these unseen ghosts into the story. The reader is hit with French name after French name like shells from cannons. The forces of shame and guilt pull upon the winds of Marc’s soul, facing the ultimate spiritual crisis of his existence as the full weight of the approaching war bears down upon him. A priest holds a staff with a clock that stops upon June 18th, 1939. Marc leaves the chapel of the S.S. Normandie, and passes through these doors to the dinning room for his last dinner at sea before he arrives in France. Through this beautiful threshold, Marc begins his journey into the worst war man has ever known, World War Two. “May the Lord be with you” is not just a wishful prayer, but also an omen of what is to come. 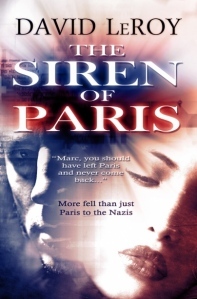 Book Synopsis: David Leroy did extensive research on the German occupation of France for his debut novel The Siren of Paris. 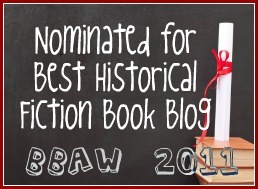 This historical novel follows the journey of one American from medical student, to artist, to political prisoner at Buchenwald Concentration Camp during World War Two. Thank you so much for this guest post! I found it really interesting and am very curious about your book now. 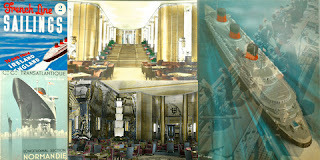 Where do I book a ticket for the SS Normandie? What a GREAT post...thanks. And a GREAT BLOG....I love stopping by to look around. Beautiful Blog. My post is up today.